Klomster is an old geezer. You know that Klomster guy, he's just an old geezer. Only thing he does is post random stuff on the site and brag about how good he is, he also blatantly post ridiculous jokes that no one finds funny as well. Like now, he's posting once again about how old he is and how much birthday he's having, becoming 24 years old. Just like the old geezer he is, when will he learn. Well, October 29th was my 24th birthday. 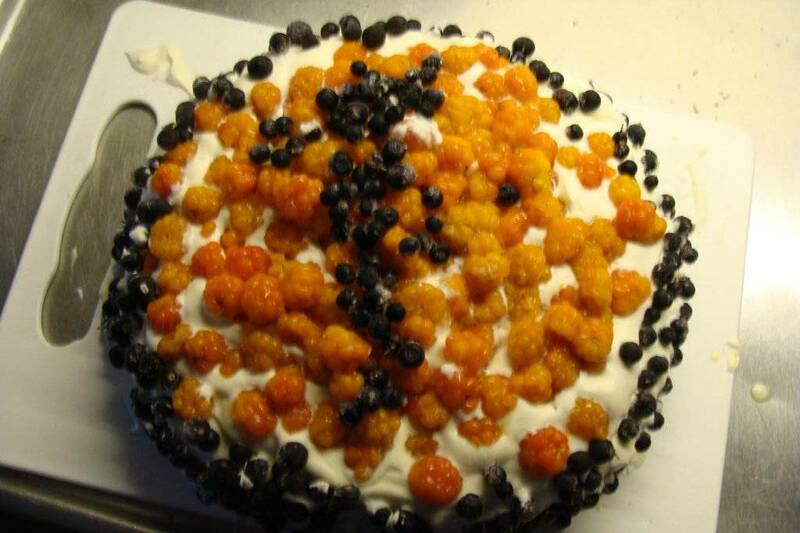 And stuff like that, i baked an annual cloudberry cake. Delicious cake with banana, strawberry jam and vanilla cream. Not to mention Swedish blueberries and cloudberries on top. Delicious. And i got some underwear. I got a pepsi T-shirt from my grandma which was spot on since my favorite drink is pepsi. It even came with a pink folding fan made of real plastic. Naturally it's pink. I put that one on my bedroom door for now. And here's a pic of the cloudberry cake i made. Well, the first of two. On the saturday i made the one in the pic for my roleplaying friends. Gotta give my best buddies some cake after all. Now i'll tell you about my SBC. Sudden Birthday Collapse, symptoms are sudden exhaustion on your birthday for no apparent reason. All in all, have a great day guys, i know i had one and i'll see you around... (Technically i won't be seeing you, unless i decide to go visit one of you, or if you decide to come visit me. Another alternative is that you are on a vacation in Umeå and i run into you and you decide to talk to me, vice versa could happen with me going to the town and/or area you live in and you decide to talk to me. The chance of me talking to you is near nil since i generally don't talk to random people around town. Another alternative is that you and/or me decide to have a get together from the forum and meet up somewhere and have a get together of some sort. Probably something miniature games related but perhaps not.... think of the possibilities? Regardless of possible times we could meet, the odds are low since i'm low on funds and will not be going where you live and you probably have better things to do than travelling to Umeå. Edit: A message from my friend after seeing this post, if you do not post an epic response to this post, you are doing it wrong. Re: Klomster is an old geezer. Very Happy birthday brother !! Thanks guys, the cake might not have been the most pretty one but it was really nice. Oh, and my room-mate took a glance through the princess magazine, and immediately when he saw the middle section he carefully took it out and put it on the living room wall. It's a picture of sleeping beauty with a bunch of animals and stuff.